A few days ago, I saw a beautiful chicken okra stew on Liz’s http://myfavouritepastime.com/ website. It immediately reminded me of the okra stew that I usually make. This one is a traditional Persian stew and as it is with a lot other traditional dishes, it is cooked slightly differently in every home. But, this is the version that I love and make at home every now and then. So, I thought I share it with all of you guys, especially Liz who asked for it in the first place! 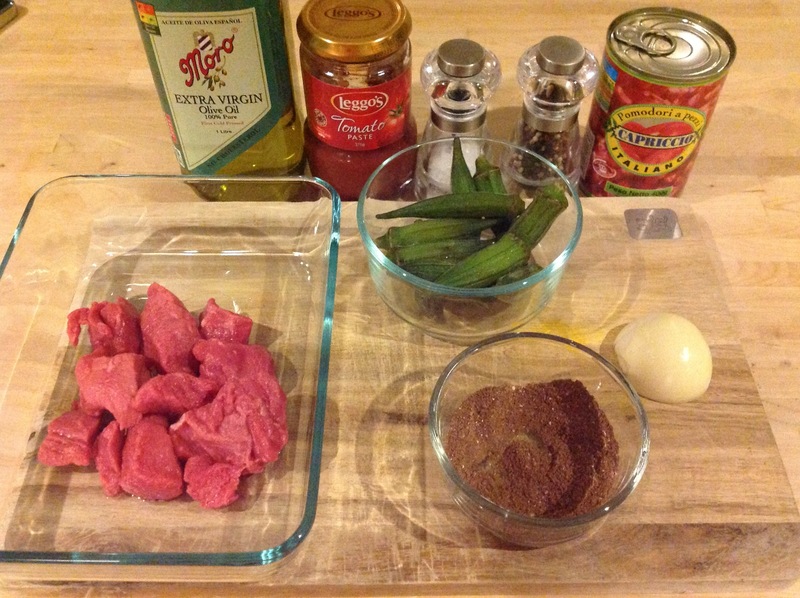 Have you made an okra stew before?Let me know what you think! 1. Heat the olive oil in a medium size saucepan. Then, add the onion and fry until translucent. 2. Add the beef and advieh spices or turmeric, and stir to coat all meat pieces with the spices. After a few minutes add the tomato paste, stir for a minute, so that the tomato paste does not burn. 3. Add the passata/diced tomatoes with 1/4 cup of boiling water, and stir well. Bring to boil and simmer on low heat until the beef pieces are tender (at least 40 minutes). 4. Add the okras with salt and pepper to the stew and make sure they are covered in the tomato sauce. Let simmer on low heat until okras are cooked, about 10 minutes. Posted in Persian, StewTagged bamieh, beef, beef stew, khoresht, khoreshte bamieh, Okra, persian food, recipe, stewBookmark the permalink. The recipe is very simple and straightforward, I shall try it this week, if I can find some fresh okra. I shall let you know when I make it. Thanks for sharing and for taking all the trouble because I asked. Have a lovely week!!! I still haven’t found fresh okra, but I’m still on the lookout. The last time I went to the supermarket, they were not fresh at all, this week was so busy, but I haven’t forgotten!!! I still look forward to trying this, if I can lay my hands on Okra. it really looks delicious! This looks delicious! Okra is not very hard to get here in Sydney, Australia. I’ll try to make this soon. Thanks for the recipe.